Mary Ann stock portfolio. The dividend-super-stocks of Mary Ann to hold forever just for dividends. Established 8.8.2017. All these stocks were bought 2017-2019. And the next years again. Royal Dutch Shell is a British-Dutch multinational oil and gas company headquartered in the Netherlands and incorporated in the United Kingdom. HSCB Holdings PLC is a British, Chinese, multinational banking and financial services holding company, tracing its origin to a hong in Hong Kong. It is the world's seventh largest bank by total assets and the largest in Europe. Munich Re Group is a reinsurance company based in Munich, Germany. It is one of the world's leading reinsurers. ERGO, a Munich Re subsidiary, is the Group's primary insurance arm. Iberdrola SA is a spanish multinational electric utility company based in Bilbao. Has a workforce of around 31,330 employees in dozens of countries on four continents serving around 31.67 million customers. In Spain, Scotland, United States, Brazil and other countries. BHP Group is an Anglo-Australian multinational mining, metals and petroleum public company headquartered in Melbourne, Australia. It is the world's largest mining company. Bayerische Motoren Werke is a German luxury vehicle, motorcycle and engine manufacturing company founded 1916, headquartered in Munich, Bavaria. BMW AG is the parent company of cars: BMW, Mini and Rolls-Royce. Sanofi S.A. is a French multinational pharmaceutical company, 2013 the world's fifth-largest by prescription sales. BASF SE is a German chemical company, the largest chemical producer in the world, comprises subsidiaries and joint ventures in more than 80 countries. British American Tobacco is the second biggest tobacco company in the world. Foundet 1902. BASF, BMW, Munich Re, British American Tobacco, Royal Dutch Shell, Banco Santander, Iberdrola, AT&T . . . . . . Wells Fargo, HSBC, Allianz. 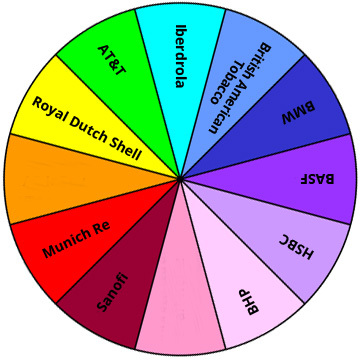 Royal Dutch Shell, HSBC Holdings, AT&T Inc., Munich Re, Iberdrola SA, BHP Group PLC, BMW AG - ST, Sanofi SA, BASF SE, British American Tobacco. BHP Group, HSBC, Royal Dutch Shell, BASF, BMW, Munich Re, Iberdrola, Sanofi, AT&T, British American Tobacco. Cisco Systems, Johnson & Johnson, Pfizer Inc., Procter & Gamble.